Abagio is a seriously fun new board game of cunning moves and calculated risk with exciting twists and turns, right up to the very end! Based on variations of ancient games from around the world - with some fresh new ideas from the 21st century - Abagio is the brand new two-player game that has been thousands of years in the making! Easy to Learn, Challenging to Master The goal: Get your 12 frogs around the board and into the center pond before your opponent does. Leaping, heaping, or racing for the safe zone, you outsmart your opponent and make the most of each roll of the dice. With every new game you will discover subtle new strategies - each one is a step on the path to the coveted title of Abagio Master. In the meantime, the journey is all about jumping past (but not too fast) and making sure that your frogs are always the top frogs. Cool, calculating type or brash risk-taker, Abagio gives every player the chance to find their own favorite strategy. But don't get too confident... a couple of leap-frogging rolls of the dice and you may find the toady table has turned! Only small amphibians and Abagio players truly know - - The sly satisfaction in hitting a blot, - The devious delight in capping a pair, - The valuable knack for maxing a stack, - How a froggy heap can foil a leap, - and why all frogs long for the center of the pond. 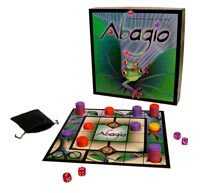 So go ahead, take the leap: Challenge friends, family, and favorite game players to the new classic game of Abagio! Abagio includes: The Abagio board,12 red frog pieces, 12 purple frog pieces, 1 yellow frog piece, one pair of red dice, one pair of purple dice, and one drawstring pouch.